Although soil has many uses, it is really just a layer of dirt between the atmosphere and the bedrock in the tectonic plates. The top layer of the planet is called the lithosphere. Soil is the loose stuff on the surface of the lithosphere. We have talked about plate tectonics and swirling clouds in the atmosphere. In the same way those conditions change, the soil changes. It changes very slowly but very definitely. It's a very complex system that supports all of the life on land. Soil is much more than just dirt. It is the result of the breakdown of rocks. The breakdown is both physical and chemical. 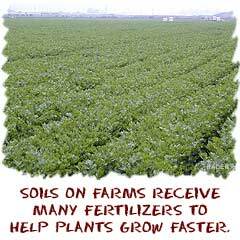 Soil is mainly something scientists call regolith. Regolith is sandwiched between the bedrock (the rock that makes up the continents) and the actual loose soil (the top stuff at the surface). If you see a tree you know its roots make it into the soil. They could even go all the way to the regolith and stop when they get to the bedrock. As the process of erosion happens, some areas are built up and some areas are destroyed. The first thing to change is the soil. One extreme example would be the Grand Canyon. Over millions of years, the Colorado River has eroded and washed away tons of soil and rocks at the surface. It all went to the ocean eventually. Inland processes work the same way. The soil and rocks from the sides of a mountain move downhill and collect in the lower areas. Slowly the valleys fill up with very rich soil and minerals. Soil is always moving. The core of soil is very small pieces of rocks and dissolved minerals. When you add in organic material that has collected over millions of years, you have a substance that encourages life on land. While animals don't get a lot out of soil, the plants do. 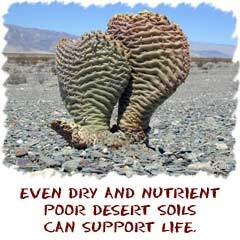 As you know, almost all land plants need soil to survive. It has the nutrients and minerals needed to support life. In a protected system those nutrients are continually recycled. When man becomes involved, the ability of soil to support life can be destroyed.